My husband and I pack school lunches for our three boys almost every day. And more often than not, their lunches contain a snack-size bag of SunChips®. So we were all excited to learn about SunChips newest flavor, Sweet and Spicy BBQ. No one was as excited as my 9 year-old though. He is a barbecue fanatic! In fact, just the other day he opted for dipping his baby carrots in barbecue sauce rather than Ranch dressing. Really. So it’s no surprise that he proclaimed the new barbecue flavor the best SunChips ever! My 13 year-old also said they were his favorite. My 16 year-old, being his usual agreeable self, said he “likes all the flavors of SunChips equally.” I loved the new barbecue flavor too! I’m almost as big a fan of barbecue as my youngest. Although I doubt I’ll be trying the carrots with barbecue sauce anytime soon. 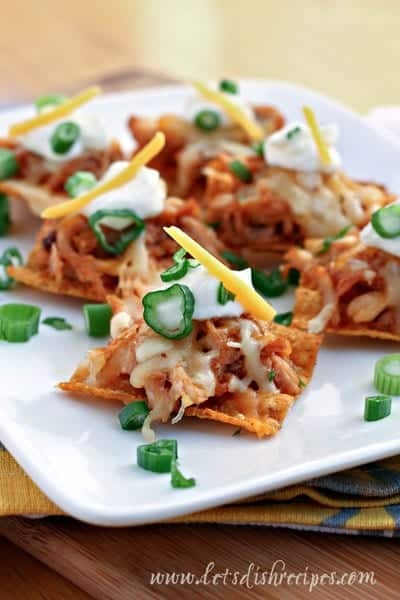 These Sweet and Spicy BBQ Chicken Nachos, however, were right up my alley. And they were a big hit with the rest of the family too. Preheat oven to 375 degrees. Arrange about 48 chips on a large baking sheet. Remove chicken meat from bone and place in a medium bowl. Stir in up to 1 cup barbecue sauce, just enough to moisten chicken. Stir in the chilies in adobo. Top each chip with about 1 tablespoon of the chicken mixture. Mix the two cheeses together and sprinkle over chicken. Bake for about 10 minutes, or until the cheese is melted and beginning to brown. Remove from the oven and top with your favorite toppings. Giveaway ends January 14, 2014. Open to U.S. residents only. You can enter below. Good luck! a Rafflecopter giveaway I received products to review for this post, but all opinions stated are my own. This is such a great recipe! We will definitely be trying it out! Pinning! These are my husbands favorite Sun Chips too! Love how you turned them into a nachos, so creative. Looks like the perfect Superbowl appetizer! 🙂 Pinning!